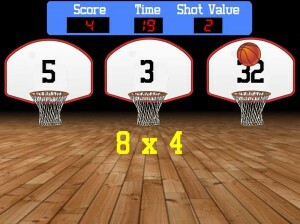 Shoot the basketball at the basket that contains the correct answer to the multiplication question. But hurry! Players only have twenty seconds to aim for the highest score they can attain! And if their aim isn’t true, the ball can bounce right out of the basket and miss! Given basketball’s already competitive nature, it is not difficult to create a group game out of this by separating the class into teams, with each team aiming to get the highest score possible within twenty seconds. They can even create their own team names, for added creativity and fun! However, the game also keeps track of the top five highest points of all the players who had played it within the day. Are the teams good enough to defeat the highest score of the day, made by someone who can possibly be across the country, or even the ocean? Who will be crowned as basketball champions of the day? Let’s find out! This entry was posted in Maths, Multiplication and tagged k2, math, multiplication by Majorie. Bookmark the permalink.